I submitted this video to the CNN/YouTube Democratic Debate taking place on July 23, 2007. I would like to know why a major issue like Energy Independence has to stay partisan? Why can't Congress compromise on safely drilling in ANWAR and raising CAFE standards and supporting nuclear power and expanding wind, solar, tidal and other renewable non-polluting energy sources? Subsidize tar sands in Canada & the US and maximize our efforts in plug-in hybrid technology for cars? I read that if we maximized our wind power in Texas, Kansas & South Dakota, we could power the whole US. Why does it just have to be all of one side's views or nothing? My first photo op! We be stylin', yeah! Fossilman, Ozzie Joe and The Poker Brat. I guess when I get better, I'll get a nickname. Attending the WSOP Academy was fun, exciting and informative, so what else could you ask for? I learned a lot and I'm positive I've got more game. I didn't win a satellite tournament this year, so I didn't get to play in the WSOP Main Event, but out of 180 attendees, I finished 20th in the academy tournament and I used a lot of my newly acquired knowledge. I won all three times I played in the Caesars Palace poker room and then after I got home, I won a online sit-n-go tournament, so it hasn't completely paid for itself yet, I'm positive it will in the future. Here's an easy riddle: What's the difference between Las Vegas in July and the planet Mercury? A: Las Vegas is hotter. Since I had workshops & tournaments from morning to evening, I didn't leave Caesars Palace for 4 days and I had my car in valet parking. They had obviously parked it in the direct sun and July 5th set a record for the date at 116 degs, so the inside of the car was probably 150+. I had a plug in car fridge that I got from OSIsoft for my 15th anniversary and that melted and warped. I'm just glad the Red Bulls inside didn't explode. I had to toss it because I was afraid that the motor that cooled it off was damaged. I had the water bottle you see below in the cup holder and the bottom softened and deformed, so now it's convex and won't stand up any more. The gum that I had changed it's chemical composition and turned into something really yucky. So the moral of the story is to self park and not on the roof. The last two night I spent in Vegas, I stayed at the Renaissance Las Vegas Hotel. It's an excellent hotel and less expensive than the hotels with a Casino. The beds are very comfy and the showerhead pressure is massive compared to most hotels and they had a nice plasma TV with free HBO. The best meal I had in Las Vegas was at the hotel restaurant - Envy The Steakhouse. I met a very nice server, Alina Gold, and I had never met anybody named Alina. She told me it's a common name in Russia and also now in Cuba and the latin community because Fidel named one of his daughters Alina. Her mother defected from the USSR and Alina was born in Nepal and I'd never met anybody born in Nepal... We had a very enjoyable evening as it wasn't very busy and I told her about the poker and about reading people. The next night I went back for dessert and she treated me to some excellent raspberry sherbert. I'm sure to go back next time I'm in Vegas. 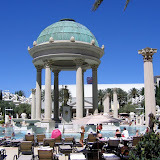 This is the end of 2007 WSOP trip reporting - here's a link to all the photos I took. I think this was the most fun day of the Academy - having ex-FBI profiler, Joe Navarro, tell us how to use non-verbal communcation to read your poker opponents. I had gotten his book and read it over the weekend and it's amazing how many things people to subconciously that give away what they are thinking. We found out that the most honest part of the body is the feet and the least honest is the face. 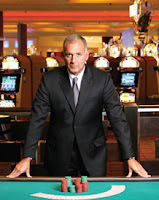 I was able to use what I learned right away in the very nice Caesars Palace Poker Room. One guy would rub his nose when he was bluffing and a woman scrunched up her lips when she saw a card she didn't like. I used this to my advantage and won a few bucks. They also have an excellent Chicken Caesars Salad that they bring to the poker table - it makes sense, eh? Today, we had several hours of presentations about strategy, we played and analyzed hands with pros dealing. We had Scotty Fishman and Annette "Annette_15" Obrestad at our table. Annette is an online poker phenom. She's from Norway and she started playing poker online when she was 15 (she's 18 now) and never deposited a single Krone because she started playing free roll tournaments. She's won about $3.5 Million in online poker tournaments so far. She can't play in the USA because you have to be 21. 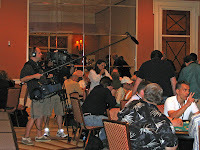 ESPN filmed the simulated games for a future WSOP show. I didn't get on film this time. 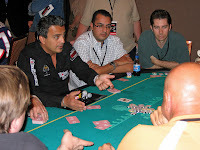 I think that Greg Raymer was the most helpful of the poker pros. Joe Hachem was also fun to listen to. On the final day Phil Hellmuth Jr. told a bunch of stories and basically said that since he, Greg & Joe play completely different styles, you just have to find your own style and the more you play, the better you can get. Day 1 of the WSOP Poker Academy at Caesars Palace. The main message was: "Be a sponge". The more information you can get about the players, their betting strategy and their tells, the better. I learned quite a bit already and today is a full day with a tournament in the evening. After the workshop, we went to the fancy nightclub, Pure, for a reception. I sat down to a guy that didn't have a badge and we talked for about 45 minutes before Phil Hellmuth Jr. came by and asked if there was any food in the joint and then I found out that I'd been talking to Phil Hellmuth Sr. For the non-poker players, Phil Hellmuth Jr. won the WSOP Main Event in 1989 and has won more (11) bracelets than anybody. Phil Sr. & I talked about everything from Scooter Libby to Paris Hilton to Oakley Sunglasses to Wisconsin (he said he's from Madison, so politically he's left of left) to poker to how it is to have a famous son and more. I thought I was going to go for about 30 minutes and bail, but I stayed for 2 hours.